You are here: Home › twitter › #oklaed #wyoedchat Chat Sunday!! Read Me!! #oklaed #wyoedchat Chat Sunday!! Read Me!! Coming this Sunday – a Mega educhat! A big thank you to Dr. Tutaleni Asino and doctoral student Alesha Baker at Oklahoma State University and Dr. Tonia Dousay at the University of Wyoming and James Kapptie in Wyoming for making this upcoming Sunday chat a reality. Also the #oklaed folks for letting me host – much love! 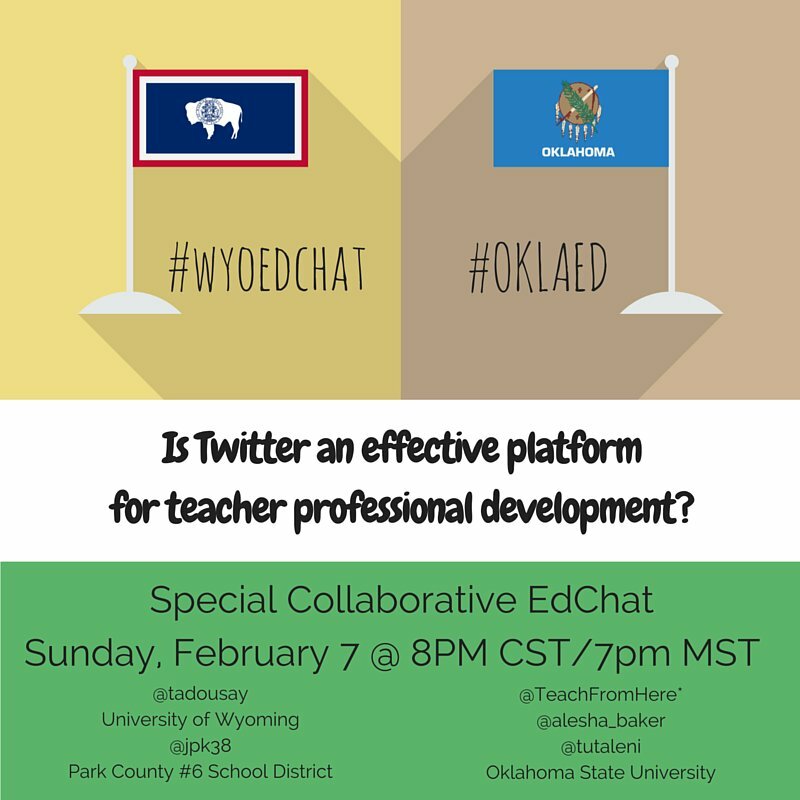 This Sunday we will be tweeting about why we participate in #oklaed #wyoedchat and more specifically – do you consider this to be professional development? I know that this is Super Bowl Sunday – I also know how passionate educators are about twitter chats. Be ready to participate and share this Sunday 8CST/7MST, as we combine #oklaed #wyoedchat!!! Take a minute to share this with other participants – it is important that everyone understands that the chat will be part of a research project. Participation in the chat will imply consent to participate in the research. You will remain anonymous. For our high school students – we will not use your data unless you are 18. Please message me at @teachfromhere if you have questions. Where/how did you first hear about #oklaed/#wyoedchat? What is a direct benefit from your #oklaed/#wyoedchat experience? Have you encountered any challenges from/while participating in #oklaed/#wyoedchat? Do you view your participation in #oklaed as PD? Why/Why not? Does your school give you any PD hours/credits for participating in #oklaed/#wyoedchat? Should they? How does your traditional PD compared to the PD you have found on Twitter? Why do you participate in #oklaed/#wyoedchat? Other thoughts that we did not ask about?